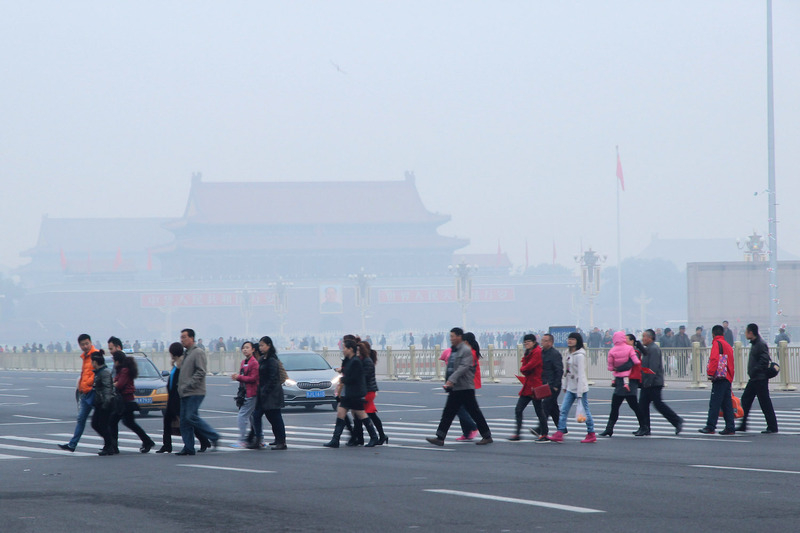 Air pollution reduces visibility in Beijing, October 28, 2013. U.S. Embassy air quality measurements reached 323 on the PM2.5 index that day, indicating a hazardous level of the most harmful particulates in the air. David Rank became the leading diplomat for one of America’s most important embassies during the transition when Iowa governor Terry Branstad formally succeeded former Montana senator Max Baucus as U.S. Ambassador to China on May 24, 2017. He soon found himself in a moral quandary: Carry out what he believed to be a deeply misguided order from the President of the United States to withdraw from the Paris Agreement on climate change, or resign in protest. He chose the latter, becoming the highest-ranking State Department official to do so—thus far—under the Trump administration. Kaiser met with Rank in his home in the Virginia suburbs of Washington, D.C., to better understand his reaction to Trump’s decision to withdraw from the Paris Agreement. Rank also discussed the current state of U.S.-China diplomacy, and looked ahead at how the two countries might work together in the future.